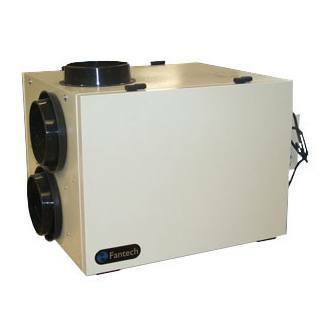 • Insulated with 1" (25 mm) foil-face high density polystyrene foam to prevent condensation and meet the requirements of the Underwriters Laboratories 94HF. CASE 22 gauge galvanized steel. Powder coated finish, antique white. Insulated with 1" (25 mm) foil-face high density polystyrene foam to prevent condensation. MOTORS Four (4) ebm™ direct drive external rotor motors with backward-curved blades. Motors come with permanently lubricated ball bearings for reliable operation. FILTERS Four (4) Washable Electrostatic Panel Type Air Filters, 11.5" (292mm) x 11.4" (290mm) x 0.125" (3mm). CORE Two (2) modular aluminum heat recovery cores configured for an efficient cross-flow ventilation. Each core is 12" x 12" (305 x 305 mm) with a 11.5" (292 mm) depth. Cores are manufactured to withstand extreme temperature variations. DEFROST During the defrost sequence, a motorized damper temporarily blocks the incoming fresh air stream so that the warm air from the house can circulate through the HRV. The exhaust blower shuts down and the supply blower switches into high speed to maximize the effectiveness of the defrost strategy. During this cycle, household odors from the kitchen or bathroom are prevented from entering the home and the unit will not create negative pressure. SERVICEABILITY Core, filters, motors and drain pan can be easily serviced through latched access doors located on front & back of the cabinet for multiple installation arrangements and for better serviceability. Core conveniently slides out with ease on an improved railing system. Electrical box, placed on the outside of the unit, can also be easily accessed.